Following the expanded meeting, a ceremony to sign the Azerbaijan-Tajikistan documents was held in the presence of President of the Republic of Azerbaijan Ilham Aliyev and President of the Republic of Tajikistan Emomali Rahmon. The Joint Declaration of the President of the Republic of Azerbaijan and the President of the Republic of Tajikistan was signed by heads of state Ilham Aliyev and Emomali Rahmon. Acting President of AZPROMO Yusif Abdullayev and Chairman of the State Committee for Investments and State Property Management of Tajikistan Farrukh Hamralizoda signed “The Memorandum of Cooperation between the Azerbaijan Export and Investment Promotion Foundation (AZPROMO) and the State Committee for Investments and State Property Management of the Republic of Tajikistan”. Director General of the Azerbaijan Industrial Corporation OJSC Kamran Nabizade and Chairman of the Board of Directors of Tajik Aluminum State Unitary Enterprise Kabir Sherali signed “The Memorandum of Understanding between the Azerbaijan Industrial Corporation and Tajik Aluminum State Unitary Enterprise”. Chairman of the Azerbaijan Television and Radio Broadcasting Closed Joint Stock Company Arif Alishanov and Chairman of the Committee for Television and Radio Broadcasting under the Government of Tajikistan Mahmadsaid Shohiyon signed “The Memorandum of Cooperation between the Azerbaijan Television and Radio Broadcasting Closed Joint Stock Company and the Committee for Television and Radio Broadcasting under the Government of the Republic of Tajikistan”. SOCAR President Rovnag Abdullayev and Chairman of the Board of Directors of Tajik Aluminum State Unitary Enterprise Kabir Sherali signed “The Memorandum of Understanding on supply of petroleum coke between SOCAR and TALKO companies”. Chief of the State Border Service of the Republic of Azerbaijan Elchin Guliyev and Deputy Chairman of the State Committee for National Security of the Republic of Tajikistan, Commander of the Border Forces Rajabali Rahmonali signed “The Agreement between the State Border Service of the Republic of Azerbaijan and the State Committee for National Security of the Republic of Tajikistan on training servicemen of the border troops of the State Committee for National Security of the Republic of Tajikistan at the Academy of the State Border Service of the Republic of Azerbaijan”. Chairman of the Azerbaijan Food Security Agency Goshgar Tahmazli and Chairman of the Committee for Food Security of Tajikistan Farhod Kamolzoda signed “The Agreement on Cooperation between the Government of the Republic of Azerbaijan and the Government of the Republic of Tajikistan in the field of veterinary service”. Minister of Education of Azerbaijan Jeyhun Bayramov and Minister of Education and Science of Tajikistan Nuriddin Said signed “The Protocol on mutual allocation of annual education quotas between the Ministry of Education of the Republic of Azerbaijan and the Ministry of Education and Science of the Republic of Tajikistan”. Minister of Economy of Azerbaijan Shahin Mustafayev and Minister of Economic Development and Trade of Tajikistan Nematullo Hikmatullozoda signed “The Agreement on Cooperation between the Ministry of Economy of the Republic of Azerbaijan and the Ministry of Economic Development and Trade of the Republic of Tajikistan”. Minister of Economy of Azerbaijan Shahin Mustafayev and Minister of Industry and New Technologies of Tajikistan Shavkat Bobozoda signed “The Agreement on Cooperation between the Government of the Republic of Azerbaijan and the Government of the Republic of Tajikistan in the fields of industry and new technologies”. 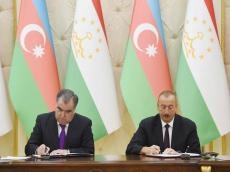 Prosecutor General of Azerbaijan Zakir Garalov and Prosecutor General of Tajikistan Yusuf Rahmon signed “The Agreement on Cooperation between the Prosecutor General's Office of the Republic of Azerbaijan and the Prosecutor General's Office of the Republic of Tajikistan”. Minister of Foreign Affairs of Azerbaijan Elmar Mammadyarov and Minister of Foreign Affairs of Tajikistan Muhriddin Sirojiddin signed “The Cooperation Program between the Ministry of Foreign Affairs of the Republic of Azerbaijan and the Ministry of Foreign Affairs of the Republic of Tajikistan for 2019-2020”.